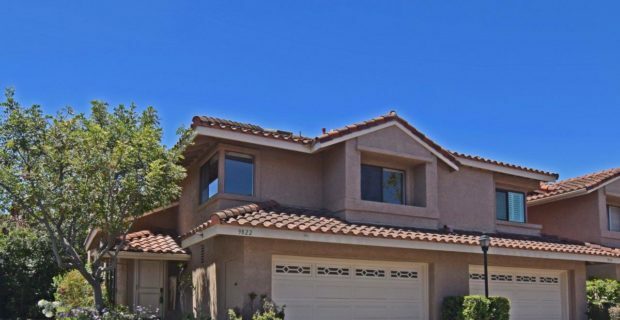 Wait until you see this absolutely gorgeous Townhome located in the Highly Desirable Mariposa Community. Rarely on the market this end-unit is the most desirable and largest floor plan with a Wonderful Quiet location. As you walk through the front door you are greeted with soaring vaulted ceilings and a beautiful open floor plan, hardwood floors, and floor to ceiling windows offering lots of natural light. This wonderful large living room opens up to the formal dining room. The family room off the kitchen adds to the open feel of this floor plan. This home features all new stainless appliances, new carpet, new paint, and much more. Association includes a pool located just steps out you front door. Convenient to shopping and restaurants, 405 Freeway & 5 miles to the beach.